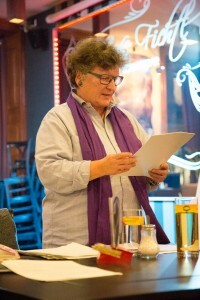 On Wednesday, 29 October, I had my first reading in German in a local venue just up the road, Café Fichtl. I used to go there in 2006 for a coffee and a snack before a year-long four-hour stint of teaching English to adults who wanted to do their university entrance exam. Then the café got a new owner, Erhard Turtenwald, and the whole place was done up to be able to cater for all sorts of gigs. The old-world character was maintained out front, but the back room where they used to play billiards became its own little bar night-clubby place. When I asked Erhard if I could do a reading there, he said “Sure! But it would be great if you could get about 30 and if they have something to drink.” Thirty was about the number that fitted comfortably without me having to go up on the stage. Stages, I find, muck up any intimacy. I had a couple of posters printed, made some flyers which I handed out locally, gave Erhard a copy of Geflimmer der Vergangenheit, so he could see what this was all about, and sent out my invites by email, Facebook and Twitter. Interestingly, Facebook and Twitter were not as effective as plain word of mouth, something I had suspected in the local reading promotion area. The print in Geflimmer der Vergangenheit is a bit small so I printed out a selection of stories in 14 point 1.5 spaced since this slows me to a nice reading speed and I don’t lose my place. Back in September I’d attended a workshop at the Schule fuer Dichtung with Christoph Grisseman on how authors can read their stuff better. I chose the stories I read to fit into just under an hour with the first one which was not in the book, an auto-fiction of sorts called “Anna und das Exil der Seele”, acting as a sort of Leitmotiv for the stories to follow. Since I knew that KrimiAutorin, Helga Anderle, was coming, I ended my reading with “Witwenspitzen”, a story about a blue-rinse woman who gets her revenge on the men in her life as a serial killer. The story was originally published in English and appeared in Valentine’s Day: Stories of Revenge (Duckworth, 2001). I could hear Helga chuckling to my left, so figured the story had not lost its impact in translation. Also present was Sharon Ratheiser, an old friend from my uni days in Vienna in the late 60s who is an artist and provided illustrations for the covers of all my story collections. “The Hundertwasserhaus” which served for the cover of both The Past Present and Geflimmer der Vergangenheit represents a part of Vienna of which I am fond. The reading went well and I was lucky to have had a very attentive audience of all ages and backgrounds filling the space. I kept my part of the bargain and didn’t stumble. Erhard got his thirty guests, and provided great food and drinks. The audience clapped and thanked me, so it was a win-win all round. Today, on the eve of the fall of the Berlin Wall, I want to thank my translator and dear friend, Eberhard Hain in Chemnitz, formerly Karl-Marx-Stadt, not only for his rendering of my stories, but also for the friendship we have enjoyed since 1973 in Geneva at the Conference on Security and Cooperation in Europe where the first free flow of information began. That friendship has survived despite the politics of distrust that reigned on both sides of the Wall, in his country as well as in mine. 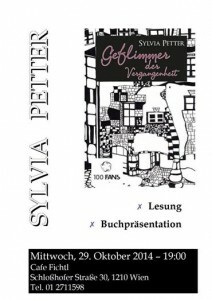 Geflimmer der Vergangenheit is much more than a collection of stories in German. It represents connections through words and cultures, friendships against all odds, collaboration and simply just having fun. 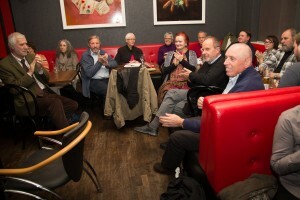 On that note, my thanks also go to Gerfried Mikusch for the photos and taping the evening. I was also so glad to have my husband, Dr Gugu, and our daughter and her fiancé, all the way from Sydney, just being there. 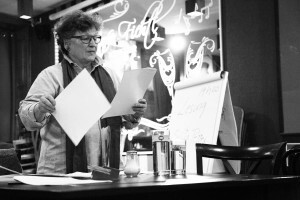 Next Saturday, 15th November, I’ll be back at Café Fichtl leading a workshop on Flash Fiction. It’ll go from 10 am to 4pm and we’ll all be having lunch there together. We’ll have the same back room and I’m looking forward to a fun day writing. Posted in: Blog, My books. Tags: Cafe Fichtl, flash fiction workshop, Geflimmer der Vergangenheit, Gerfried Mikusch, Helga Anderle, reading, Sharon Ratheiser. It was a great evening, Cat. But I was exhausted at the end after standing for an hour. Found though that standing is much better when not using a mike. Ta for the thumbs up.